When The Who re-released Live at Leeds in 1995, AKA the live album to end all live albums, they nearly doubled its length. It was a gutsy move, especially since so many fans had come to cherish the six-song original. But rather than ruining their classic recording with the revisions, the new record was somehow even stronger. Particularly bold was the decision to include the first four cuts from their set that day, so that those familiar with the 1970 version would have to wait until track 5, “Young Man Blues,” for their beloved side one to begin. 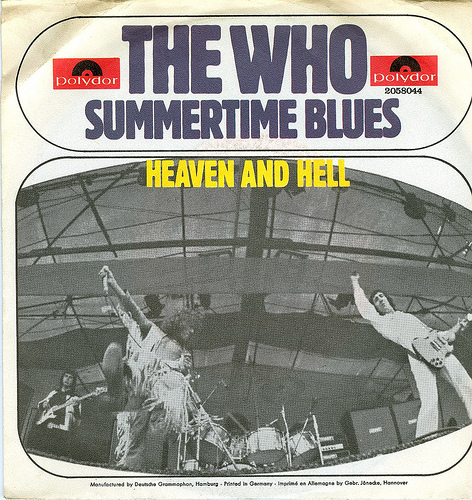 The band was opening in those days with a song that had yet to be recorded, John Entwistle’s pummeling “Heaven and Hell.” It eventually appeared as the b-side of the only single from Live at Leeds, “Summertime Blues.” Entwistle’s compositions were (and remain) an acquired taste, arch little confections with a black sense of humor and a prominent low-end. 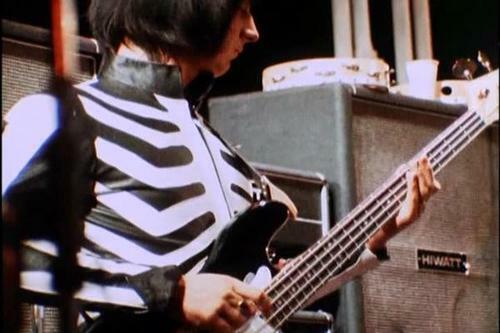 When critics talk about songs sounding “as if they were written by the bassist,” they usually do so pejoratively, and some might say that Entwistle’s songs are prototypical in that regard. With the notable exception of “My Wife” off of Who’s Next, one often got the feeling that the band wasn’t quite as invested in his tunes as those of Pete Townshend’s, and justifiably so. “Heaven and Hell” may have the low-end intensity of many of “The Ox’s” songs, but it’s clear from the first notes that the band has fully embraced this one. Keith drums up more of a storm than usual, Daltrey struts like mad, Townshend sounds like he’s on a rampage and Entwistle’s bass line is hyperactive to say the least – they didn’t just take the stage, in other words, they attacked it. Led Zep, eat your heart out! The song would be worth writing about if only for the sonic assault, but what interests me more is the overall feeling of the performance: the band lends the tune a gravitas that supplants whatever Entwistle’s intent was. When Daltrey, Townshend and Entwistle sing the chorus, “Why can’t we have eternal life? And never diiiieee?,” there’s an undeniable spiritual yearning, or at least, a power that goes beyond the satirical (not to mention an inadvertent rejoinder to their infamous “hope I die before I get old” line from a few years beforehand). Those words, indeed, the question of eternal life, strike a note that’s much deeper and resonant than they may have realized or intended. Or maybe they did realize it and that’s why they opened their concerts with it. In any case, when Daltrey shouts “heaven, heaven, heaven and hell” over the simultaneous soloing at the end, the apocalyptic (or eschatological) aspect of the song takes on deathly seriousness – the issue at hand is obviously and significantly bigger than they are, thank God. So while they may not have known what they were doing, and they may have even intentionally tried not to do it, for a few moments, The Who were playing gospel. Or, you might say they were playing Law – you get what you deserve, baby – and the Gospel would come later in the concert, in the last few minutes of “A Quick One,” i.e. the incredible “you are forgiven” climax. Amen! The Who (Townshend, in particular) is deliciously confused. That gives them something to say, I think. Mich, I’ve heard all those albums and Live at Leeds beats them all. It just rips. And I was a huuuuge Allman Brothers guy in college (I even got backstage with them). For visual musical wonderful-ness Live at The Isle of Wight is just amazing. “Young Man Blues” is sublime. I hate to lower this post to the level of serious debate, but The Who have always had a seriously spiritual edge for me. I have a battle raging in my head about ‘contemporary Christian’ music being so self consciously ‘down with the kids’ and trying so hard to be relevant that i have yet to find more than one band I like (Gungor – and some of their stuff is just a bit too ‘rawk!’). After all – Christians were never called to be relevant. So when Townshend writes about ‘gotta give up all I got’ in Bargain that is such an awesomely spiritual song (even though its for Meher Baba) that I can put it into my Christian context very simply. And not have to suffer ‘hands in the air repeat the first verse! !’ Third Day.